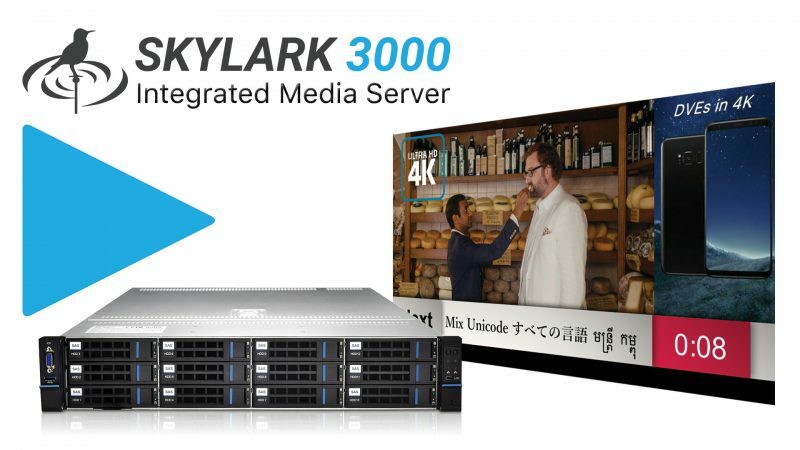 SKYLARK 3000 is a powerful media server system that provides high-efficiency workflows and simplicity for broadcasting operations. Combining file, baseband, and transport stream workflows have never been easier. SKYLARK 3000 provides comprehensive Channel-in-a-Box (CiaB) capabilities, including live switching of baseband and IP sources, media file services, transcoding, back-to-back playback, loudness control, advanced graphics and simulcast with baseband and IP program outputs. SKYLARK 3000 simplifies the creation and management of channels and enables media companies to extend their brands and content with more freedom, visibility, and control in an entirely software-based environment. SKYLARK 4000 is a Multi-Channel Time, Profanity and Transport Stream Delay Server. Series 4000 offers you multi-functional solutions for Time Delay from seconds to several days for re-transmission after a specified time period. Time-zone differences can easily be compensated at transmission or reception; and short delays of only a few seconds allow profanity screening in live broadcasts. With the simple push of a button, content censors have the ability to remove video and offensive sounds before the content reaches the airwaves.